Handcrafted Metal makes exquisite zinc kitchen island to suit your taste and accommodate your kitchen. With us you can customize every dimension and feature. You can also add detailing, such as fancy edges, backsplashes, hammering, and drainboards, to give your zinc kitchen island a powerful presence in your kitchen. 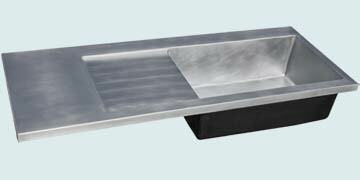 Each zinc kitchen island is fully welded and polished, and made with the purest zinc available. Feel free to choose how your zinc kitchen island countertop will look, by combining our custom features into the perfect custom zinc kitchen island for your kitchen. We will work with you to produce a work of art for your kitchen. To get started, click any of the zinc kitchen island countertops below to see pricing and customize your dimensions and features. The highlight of this functional island countertop is the 4 elegantly detailed edges, which continue without interruption through the scroll corners. Framed openings accomodate an under mount prep sink and a large slide-in range. It's made from smooth 16 gauge zinc, has cast scroll corners, and features a natural finish. An amazing island with a raised, curved bar. The bar has our Mont St. Michel edge, and the countertop has our matching smaller Mon Ami edge. The framed opening is for an undermount farm sink. Smooth all welded 16 gauge zinc, natural highlight finish with wax. This large elaborate zinc island features our Giverny edge which includes dentil pattern along the middle ridge. It also includes extended corners to cover 4 corner posts on the island cabinet below. The angled area includes a large overhang to make an eating area. The angled corners creating an interesting shape. The framed sink opening accommodates a ceramic undermount sink. Smooth zinc, natural finish with hand rub. This island features our new sink opening with rounded corners. We created this curvy opening to center on the top edge of a Shaws sink, and echo the curves of the sink. The corners at the rear of the top are an unusual inside notch design that follows the cabinetry below. 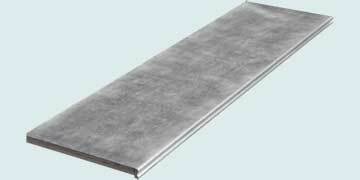 Smooth all-welded 16 gauge zinc, natural finish. The curved ends on this island give it a French flavor, and the round cutout accommodated a white ceramic drop-in sink. The entire piece is made from smooth zinc, and is naturally-colored and highlighted with a hand rub. This wide Island countertop features our Moderne edge. It also has 3 faucet holes and a 3-sided cutout for a sink. The entire countertop is made from smooth zinc, and is naturally-colored and highlighted with a hand rub. Our Chambord edge adds a lovely accent to this simple island. This dimensional edge is free of ornamentation and elegant in its simplicity. 16 gauge all welded zinc, natural hand rubbed highlight finish. A delightful textured surface gives this long island a unique quality. The zinc is fully reverse hammered. The rustic texture on our Mont St. Michel edge lends a hand-made sensibility. Reverse hammered zinc, light antique. patina. The extraordinary size of this island is emphasized even more by the low profile edge. 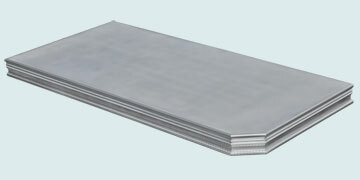 Our 2 inch edge provides a sleek, thin edge appearance. 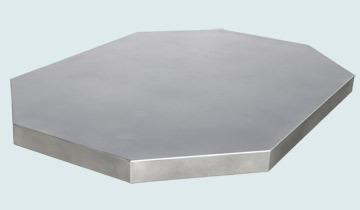 Large tops like this one require multiple deck welds, which we make as invisible as possible. Smooth zinc, natural finish with hand rub. 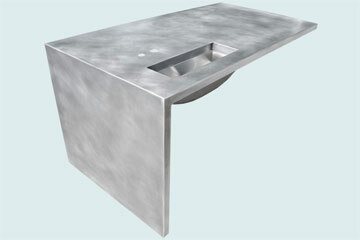 This sink island features our 2 inch tall Mon Ami edge on all sides. The decorative edge transitions to a smooth framed opening around a custom matte stainless steel apron sink. 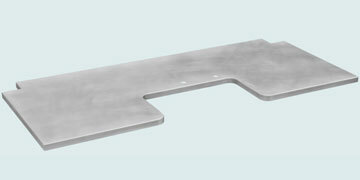 The 33 inch width is the maximum that would fit on a single sheet of zinc. Smooth zinc, natural finish with wax. Matte finish stainless sink. This large island top has a convenient curved overhang that provides an eating area. The simple Normandie edge keeps focus on the sublime feathered pattern of the surface. It has a nearly invisible deck weld, too. The entire piece is made from smooth zinc, and is naturally-colored and highlighted with a hand rub. This small scale kitchen island features our marine Mon Ami edge and 1 1/2" radius rounded corners. The square opening accomodates a cook top. 16 Gauge smooth zinc, natural finish. This large seamless welded island top with Bistro edge required a weld that ran the entire length of the top. Our Bistro edge puts a fine finish on the edges. Smooth 16 gauge welded zinc, natural finish with hand rub. This large island accommodates an undermount sink with a framed sink opening. 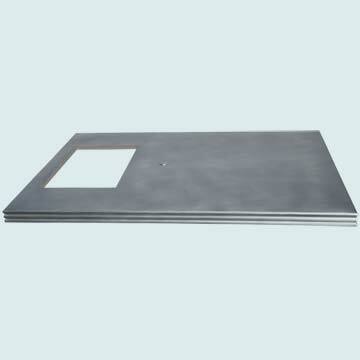 It includes invisible deck welds because the large size requires multiple sheets of zinc. The large area of hammering becomes a focal point in and of itself. Reverse hammered finish, light patina. This exquisite large island has a framed opening for an undermount sink. We asked for the sink so we could get the dimensions and coves exactly right. There is a barely visible deck weld across this deck since the size requires more than one sheet of zinc metal. The finish is natural with a hand rub. 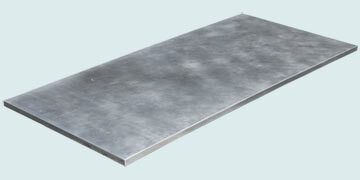 This 75" x 55" zinc island required 2 sheets of zinc which we joined with an invisible deck weld. 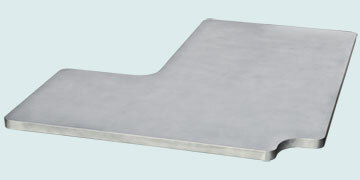 The simple edges and basic rectangle shape form a smooth slab. All welded smooth 16 gauge zinc, natural hand highlighted finish, 2 layers of cabinet grade plywood substrate. A seamless waterfall end panel gives this zinc island top an unmistakeable modern flair. We provided a rectangular framed opening for the stainless sink. This island top mounted over an existing cabinet, so there was no need for cladding on the back side of the waterfall. Cladding can be added in cases when the back side is exposed. This price does not include the stainless sink. All-welded 16 gauge zinc, natural finish. This extra large 7 ft x 14 ft island becomes the focal point just from its size. 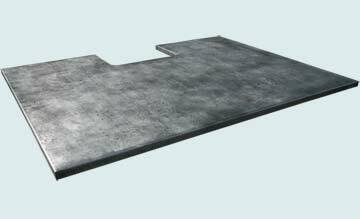 The epic scale of this zinc island top is nicely accented by our Mont Saint Michel edges on on all sides. The sink is our custom matte finish stainless steel undermount farmhouse with a framed zinc insert in the apron and stainless steel towel bar. 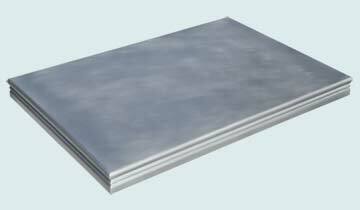 The countertop is smooth zinc, natural finish with hand rub. This island fit into a kitchen with an angled corner. The 5-sided shape allowed a consistent walkway width between this top and the adjacent counter tops along the wall. Simple bullnose edges keeps this top a low key design element. The 48 inch width dimension required a long weld down the length of the countertop. Smooth zinc, natural finish with hand rub. 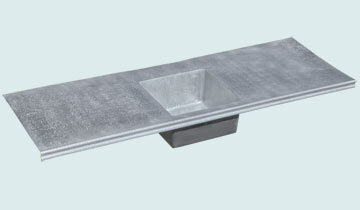 This custom zinc island top was built with 16 gauge all-welded zinc. 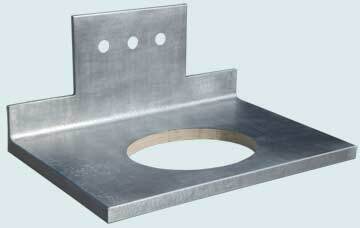 The top was sized to fit on a single sheet of zinc, which avoided deck welds and reduced the price. The edges turn down and then under, and all corners are welded and polished. 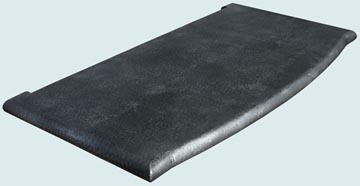 Our sublime reverse hammered texture increases durability and reduces scratches. Our natural finish acquires a fine medium gray color over time. Flat edges and a 4-sided framed sink opening keep this zinc island's shape and features simple. The edges are 1 5/8" height, and the framed opening is 1 1/2" height. Smooth 16 gauge welded zinc, natural finish with hand rub. Handcrafted Metal takes pride in our very high quality craftsmanship. We see your Custom Zink Kitchen Islands and Bar tops order as an opportunity to deliver our uncompromising design and craftsmanship. 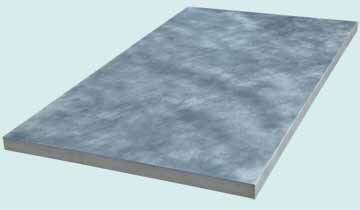 You can see that we offer a large number and an amazing variety of zinc Island kitchen tops designs. Our 25 years of experience in building zinc island kitchen tops in every size, shape, and color gives us mastery of the essential methods, processes, and skills needed to produce a zinc kitchen island that exceeds your expectations. 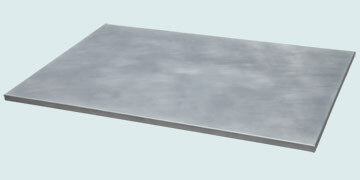 We have built thousands of Zinc Kitchen Islands. The vast array of styles, finishes, textures, and metals available for Handcrafted Zinc Metal Island Kitchen tops provide almost unlimited choices. 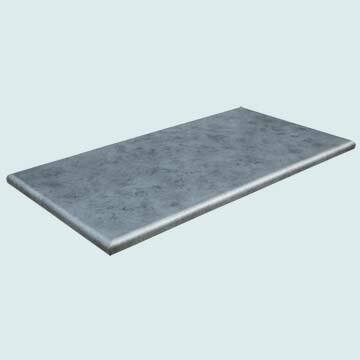 We offer an extensive selection of Zinc Kitchen Island Countertops styles. 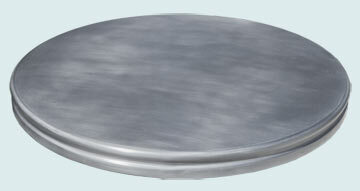 Just browse the Zinc Island Style to see wide range of zinc kitchen islands products . 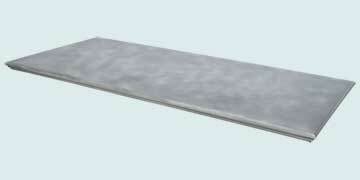 We are glad to answer any questions about any of our Zinc Island Kitchen Counter tops. Call 1-800-755-0310 to speak with a product specialist who will help you select and configure your ideal zinc kitchen island. Handcrafted Metal Kitchen Island and Island Kitchen Counter top are built in a way to be the focal point of your kitchen or Bar.